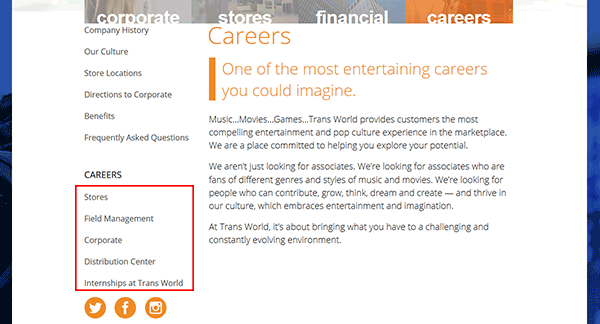 The online FYE job application is available on the company’s careers website (link posted both above and in the guide below). Management, corporate, retail/hourly, and distribution positions can all be applied for by visiting the careers page. Read the guide posted below to learn how to search for current openings in your area and apply for them online. About the Company: FYE is an American chain of entertainment stores based out of Albany, New York. The company was founded in 1993. It currently has numerous locations throughout the country. Step 1 – Click this link to be taken to the main careers page. Step 2 – Scroll down and select the type of positions you want to search for (e.g. stores, field management, corporate, distribution center, etc.). Step 3 – Click the link as outlined in the screenshot to be taken to the main job search page. Step 5 – Enter a keyword, city, state, or zip code into the form and then press the “Search” button to view the results. Step 6 – Select the jobs you want to apply for, scroll down the page, and then click the “Apply to job(s)” button. Step 7 – If you have an account sign in to it. If you don’t have an account you must click the “Click here to create a login” button. Step 8 – Fill in your email address and then create a password/security question and answer. 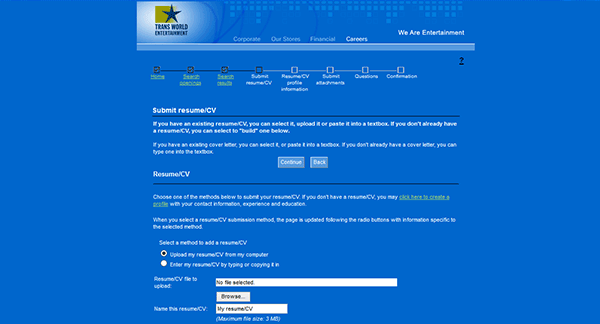 Upload your resume, CV, or cover letter into this section (optional).